The crisp beauty of the winter season is a wonderful theme for your special day, so enhance the décor with the winter personalized champagne flute favors. These wonderful winter favors stand 8.5" tall and include a 2.125" diameter with intricately designed stem. You select the style and color which will be screen printed onto the front of each glass with your names and event date. 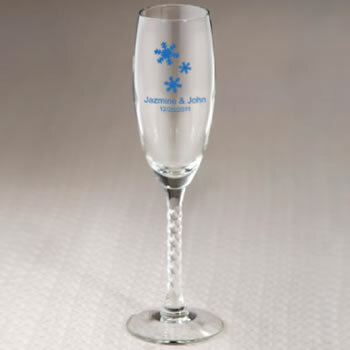 Toast in style with the winter personalized champagne flute favors. When I found this item online I was very excited because it was exactly what I was looking for. I was a little hesitant because the price and what I thought I was getting seemed to good to be true. When I got them in the mail I was so excited because they were absolutely perfect! The quality was great and the graphic on the flutes were beautiful. Great product at an awesome price! !